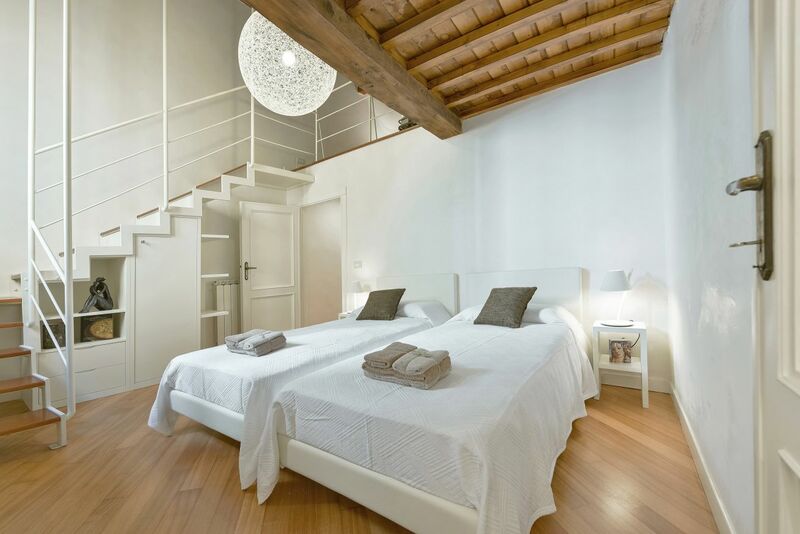 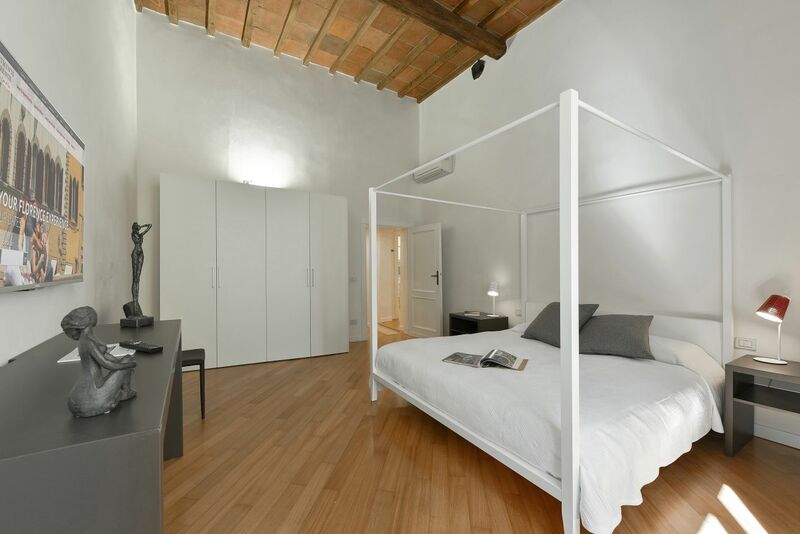 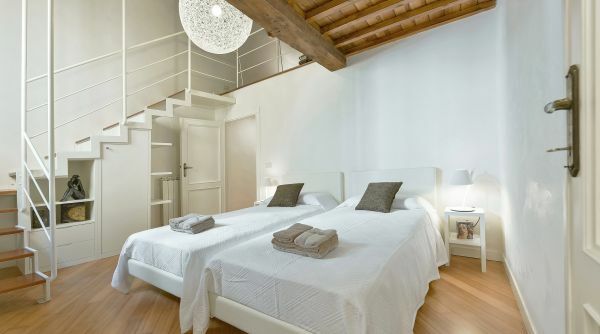 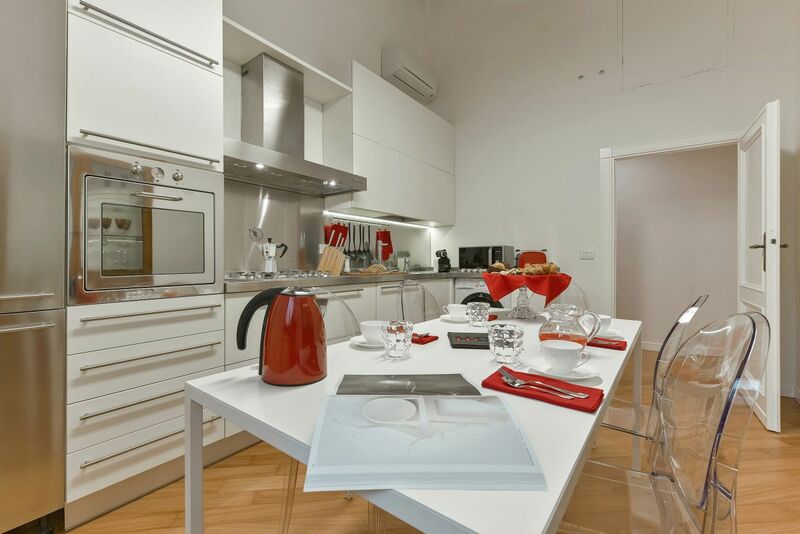 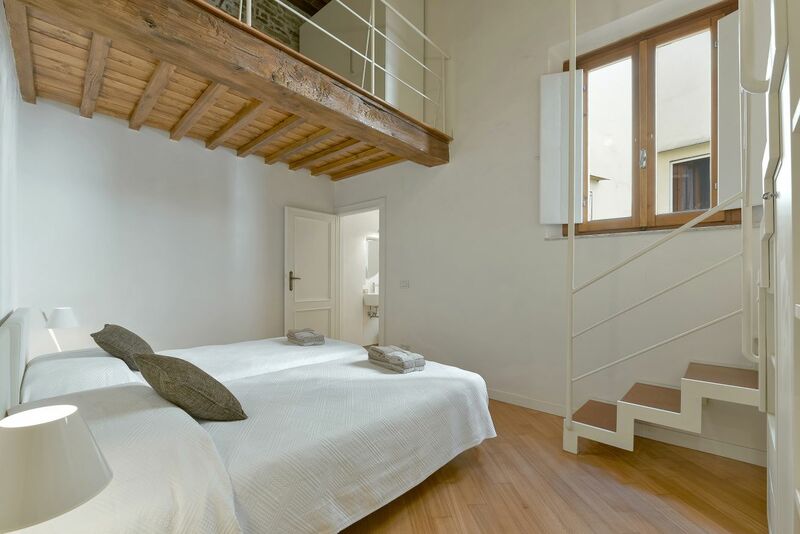 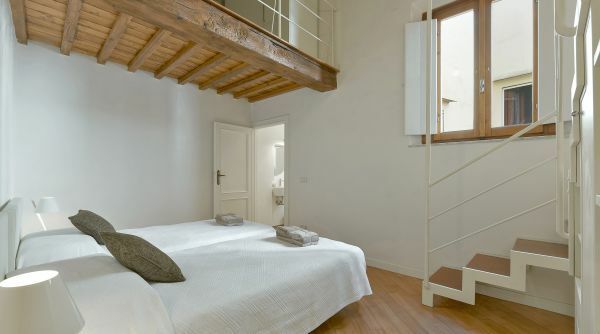 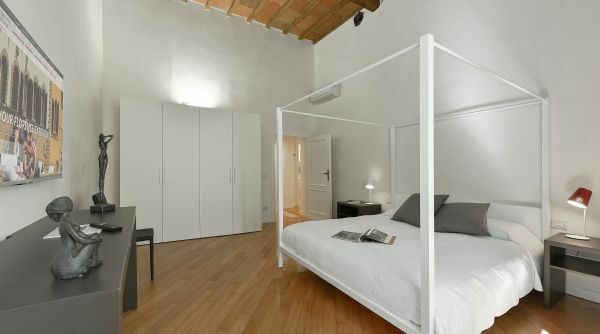 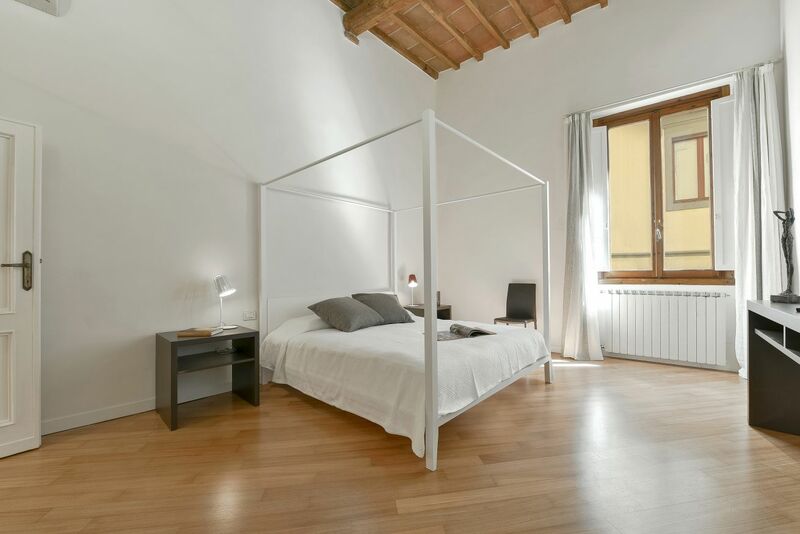 A stunning luxury location filled with natural light and decorated with great taste, for your classy holiday in Florence. 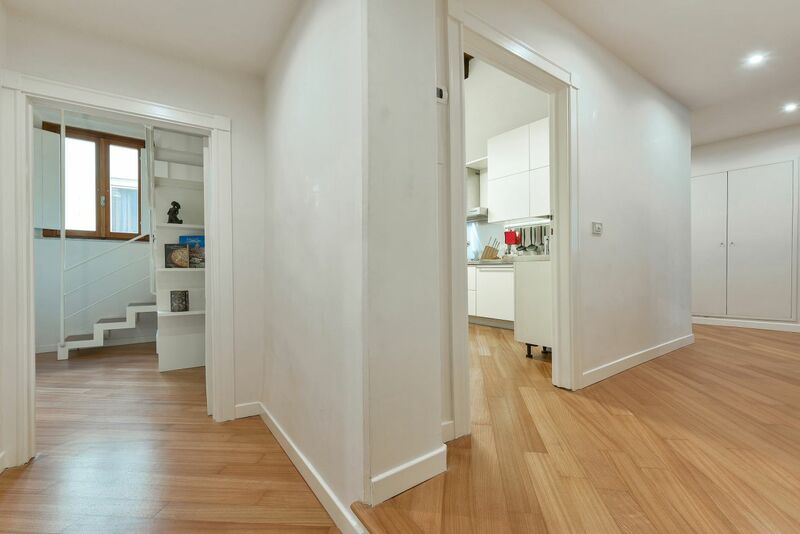 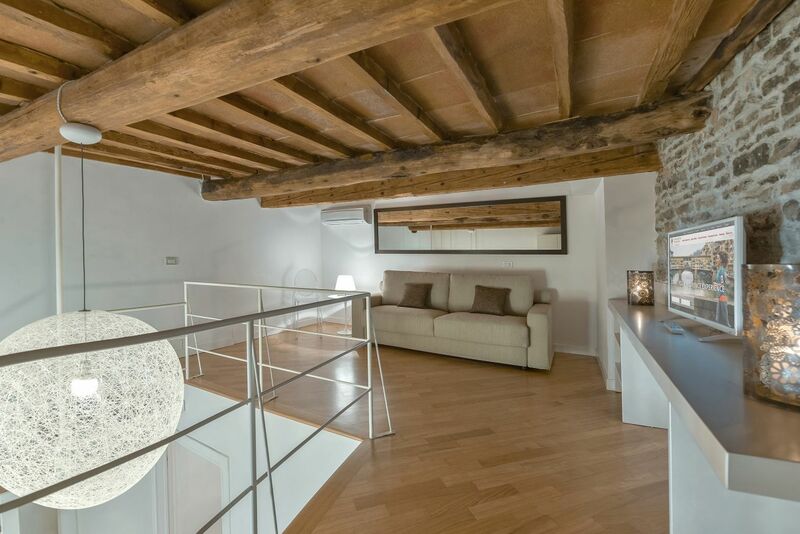 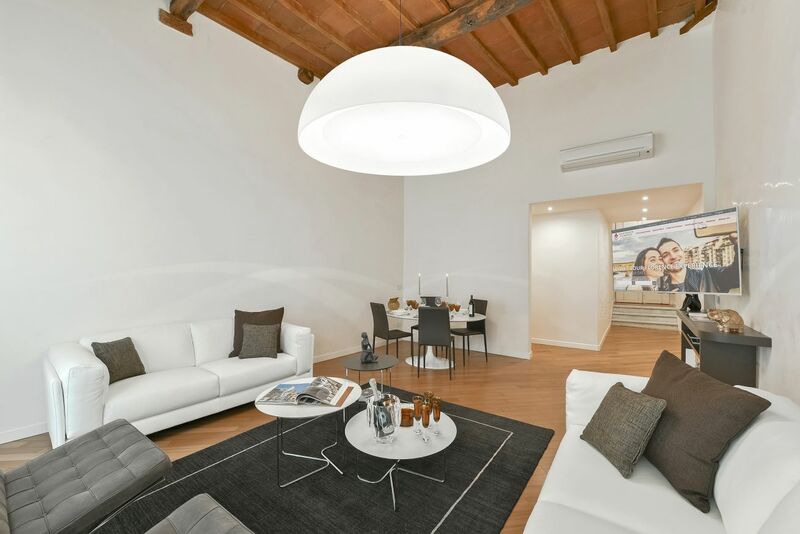 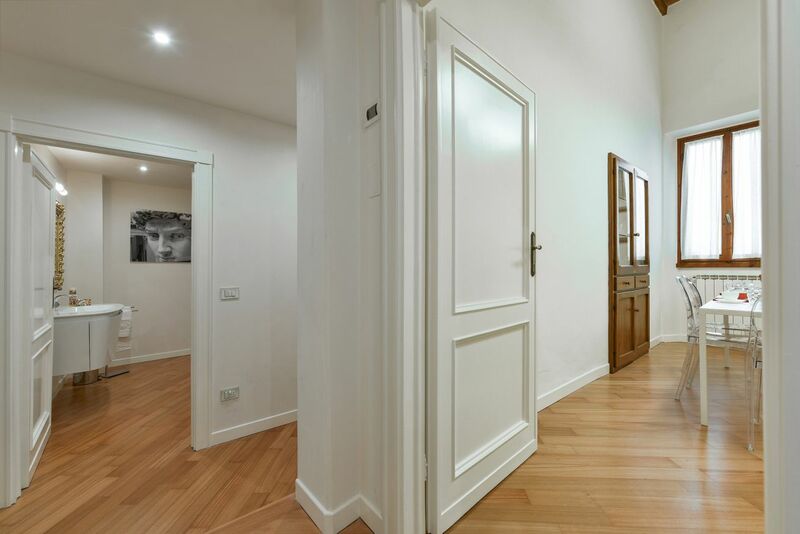 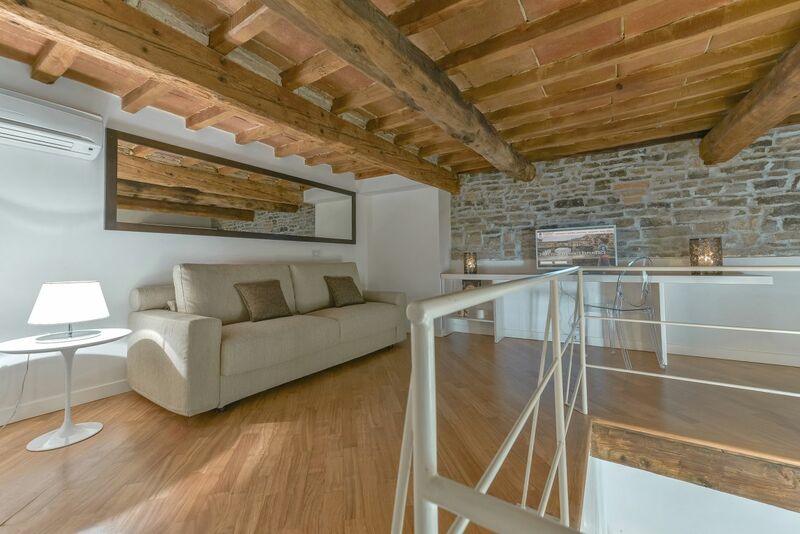 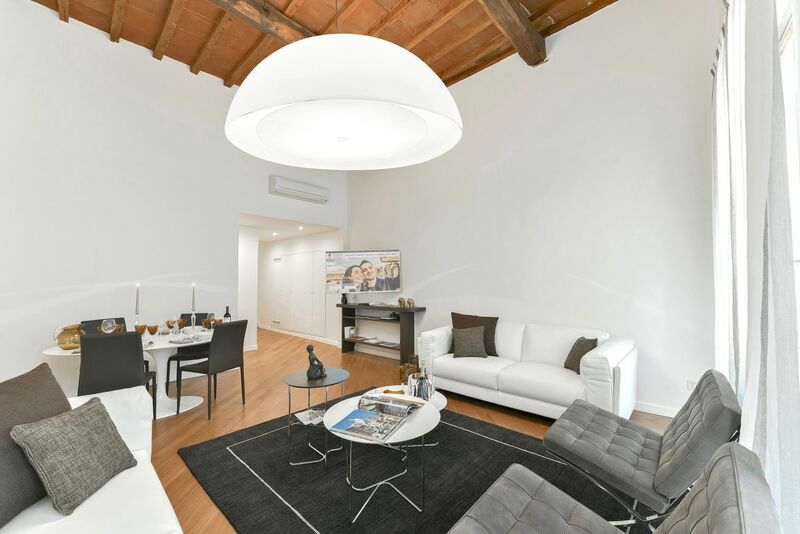 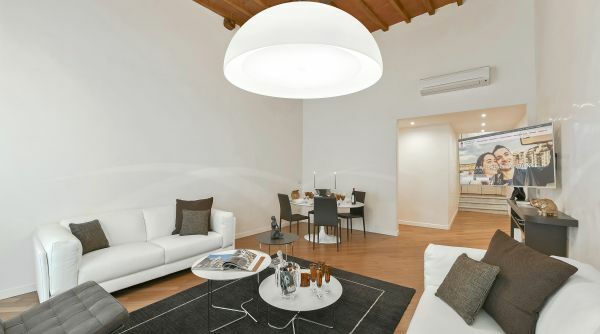 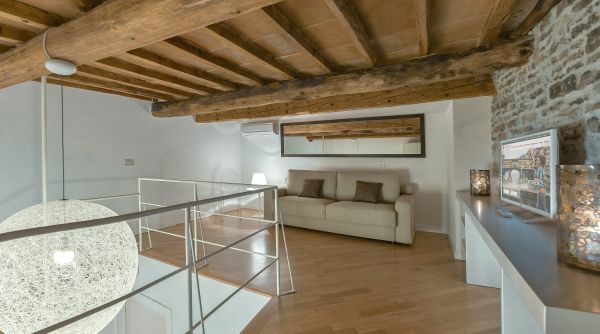 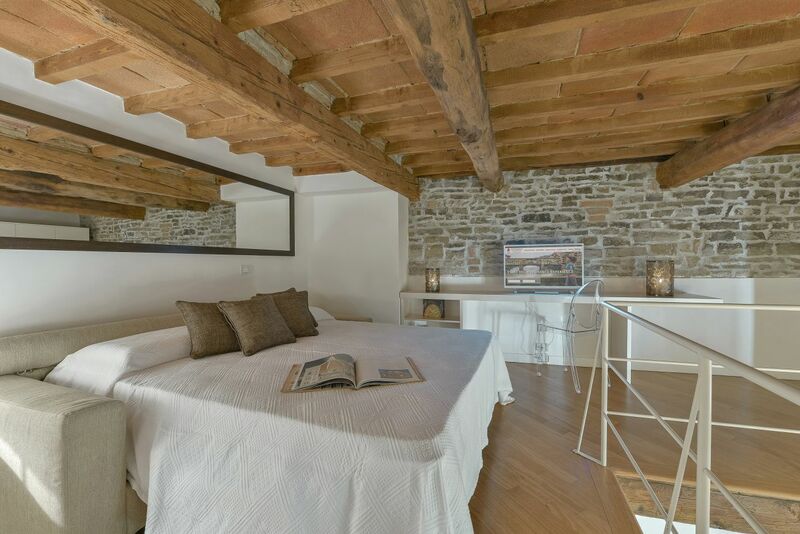 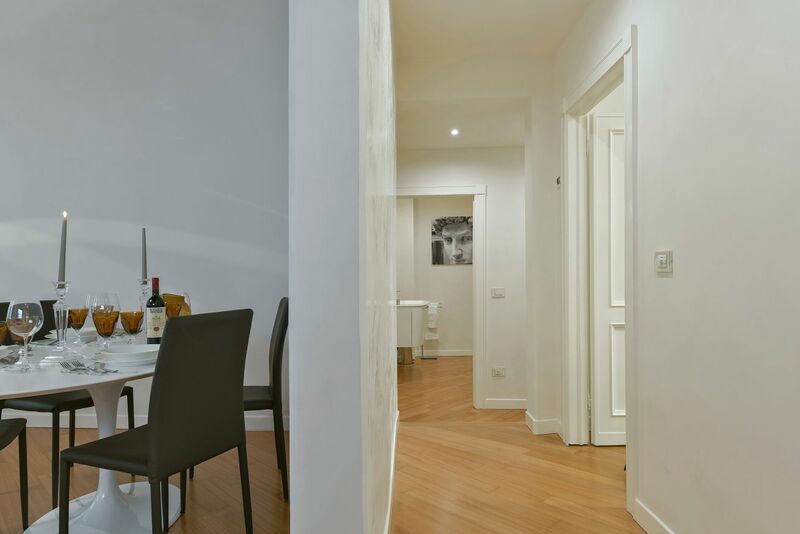 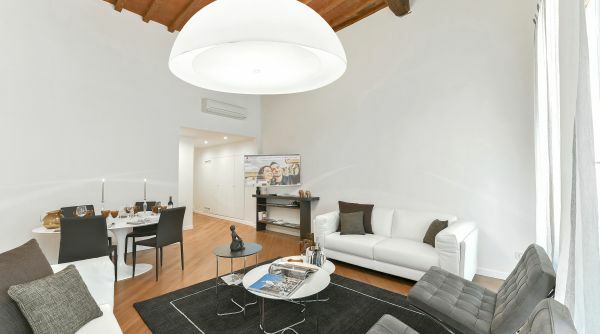 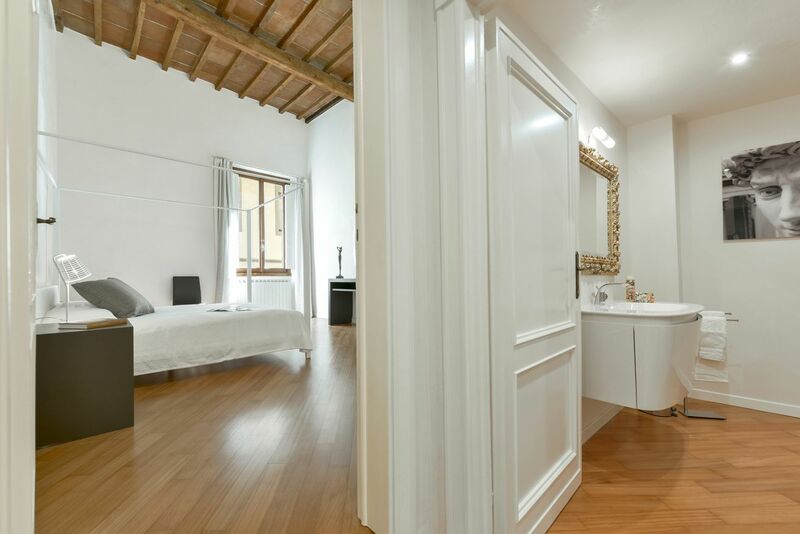 This apartment is located on the second floor up of a characteristic building on Via delle Belle Donne, a charming and rather quiet street nested between Piazza Santa Maria Novella and Via Tornabuoni. 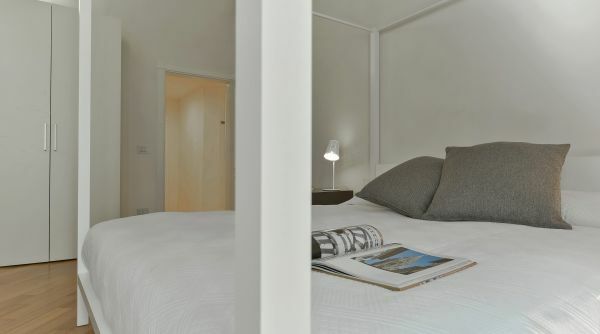 The whole place has been recently renovated and redecorated with great taste and attention to detail and luxury comforts. 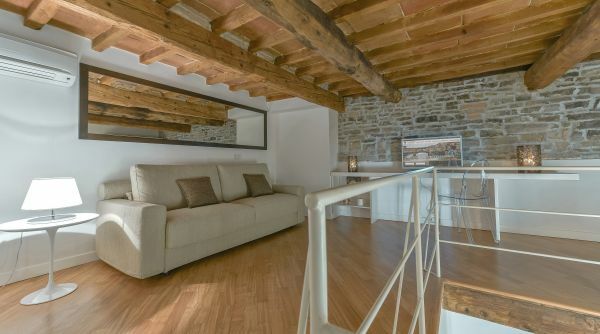 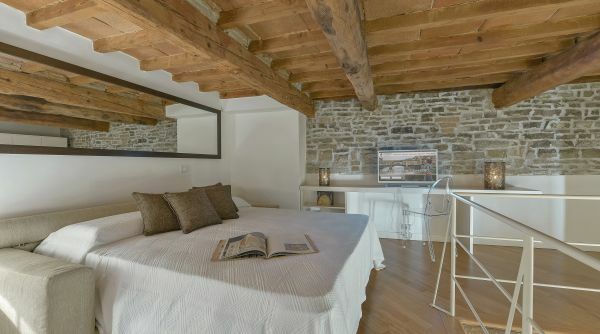 High ceilings, parquet floors, classy and elegant style combined with rustic features, such as exposed wooden beams in the ceilings and exposed stone walls, create a wonderful, charming and typical atmosphere, but with a contemporary twist. 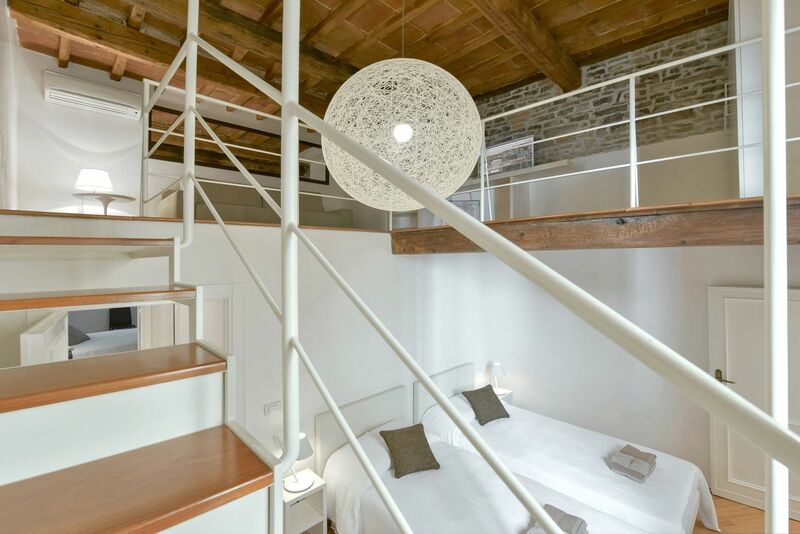 This apartment can accommodate up to six guests thanks to the two bedrooms, two bathrooms and the double sofa bed. 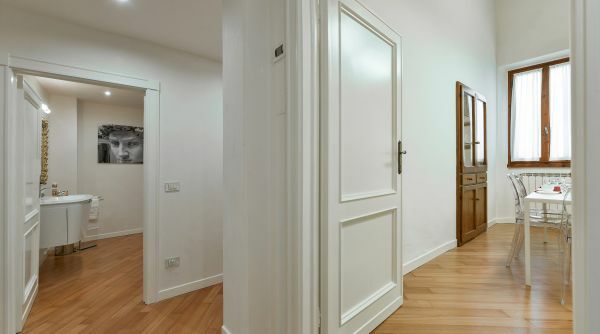 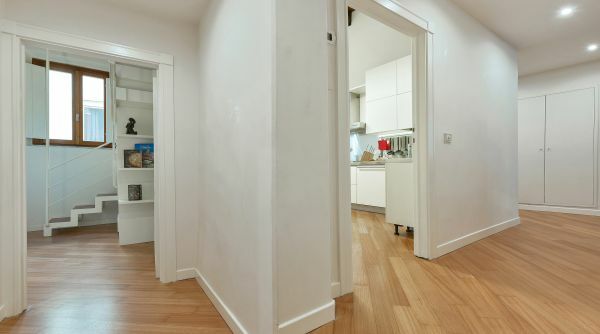 The entrance opens onto a corridoor leading to all of the apartment's rooms. 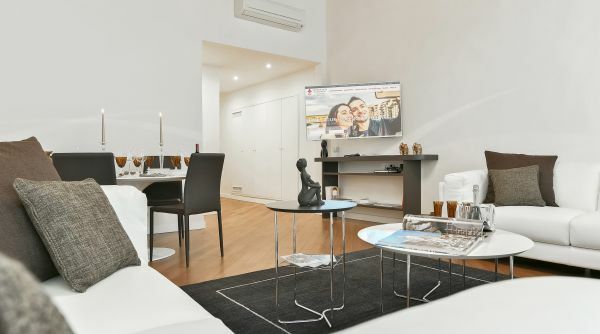 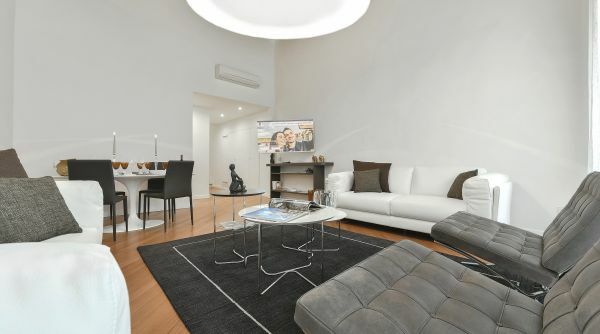 First you'll find the living area: an airy, bright and welcoming space, flooded with natural light thanks to the high ceilings, equipped with two confortable leather sofas, Mies van der Rohe armchairs, flat screen smart TV and a classy Saarinen dining table for six. 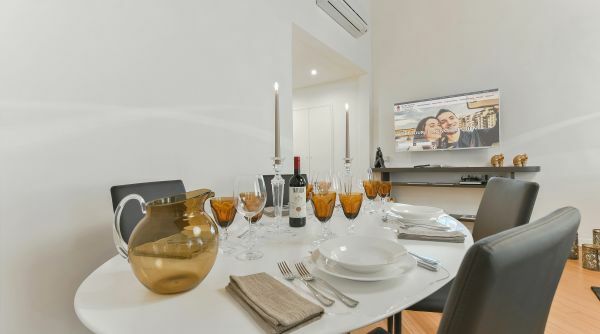 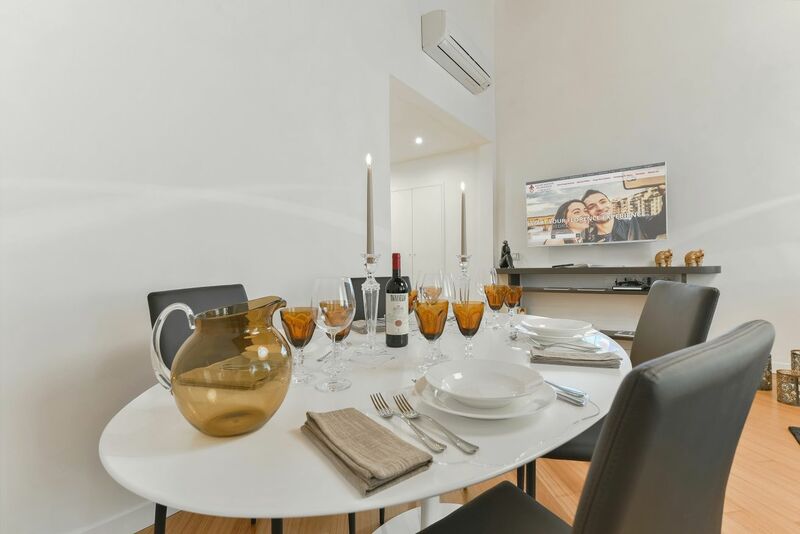 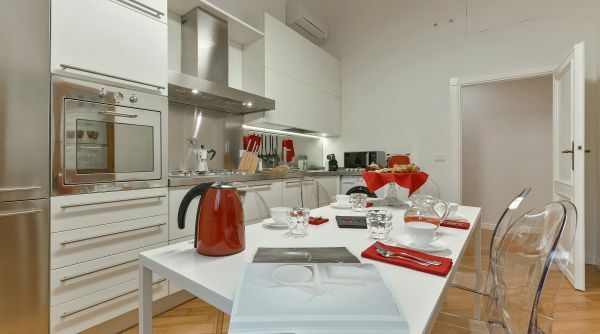 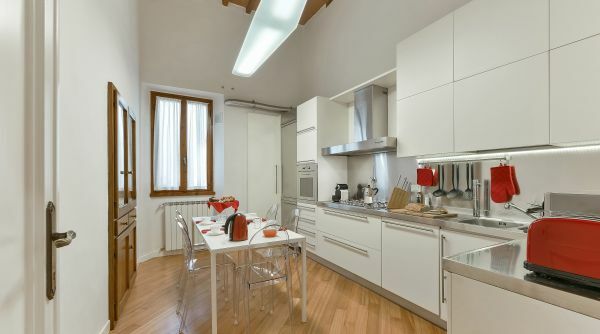 The kitchen, also very spacious and bright, is modern and equipped with an extra dining table and literally anything you may need to cook your own Italian pasta at home. 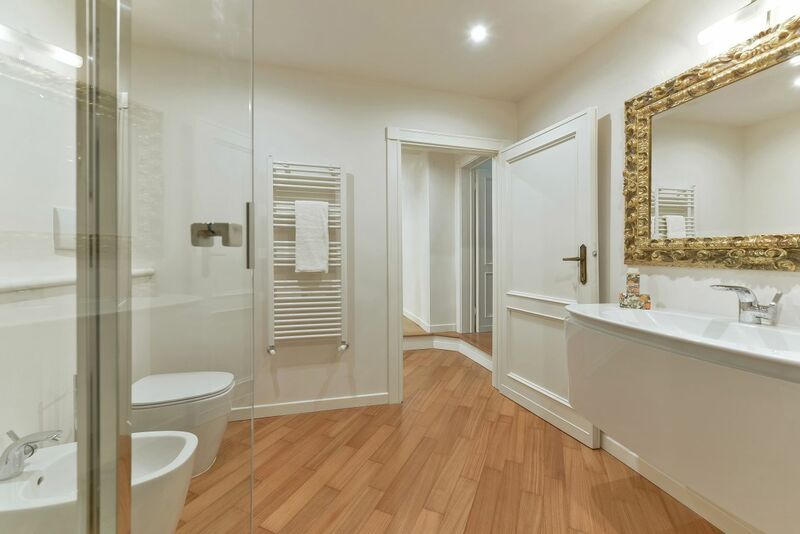 A water depuration system has been installed in the kitchen, thus guests will always have fresh, natural or sparkly water at their disposal. 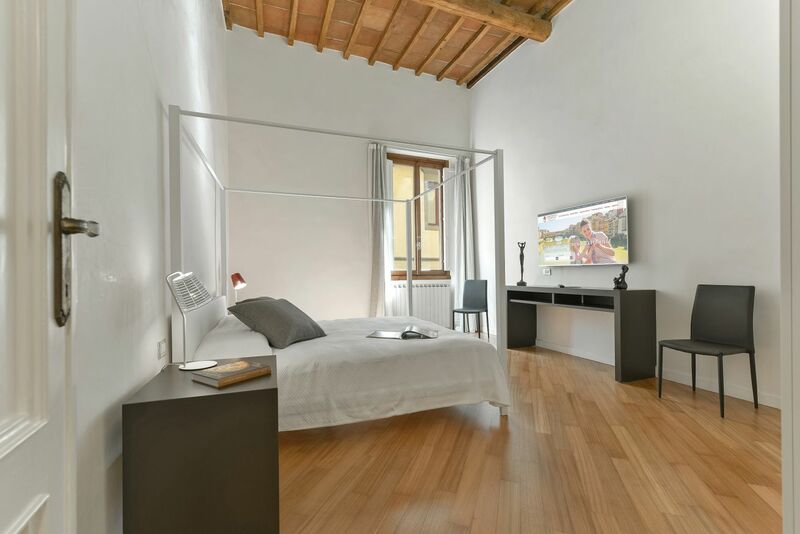 The master bedroom is very large and elegant, featuring a comfortable king size bed, closet, desk and flat screen smart TV. 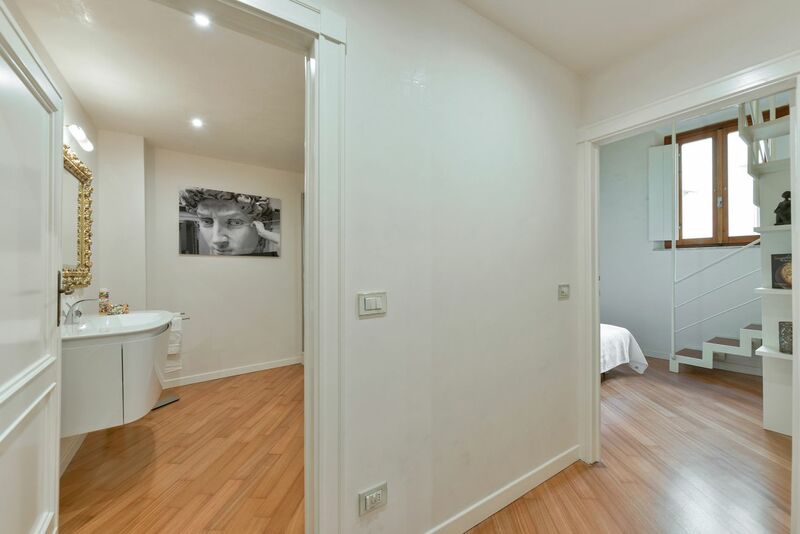 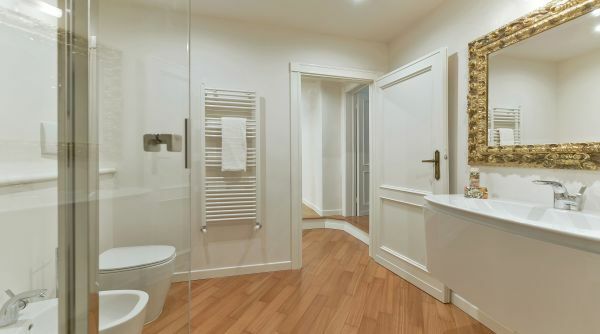 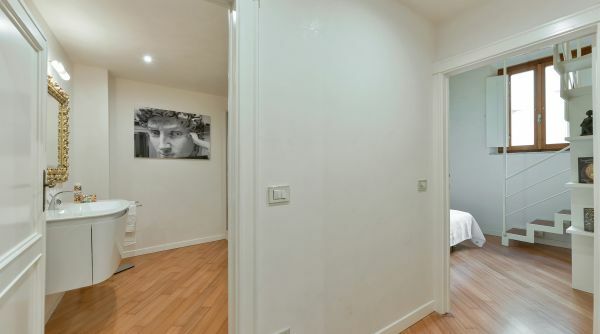 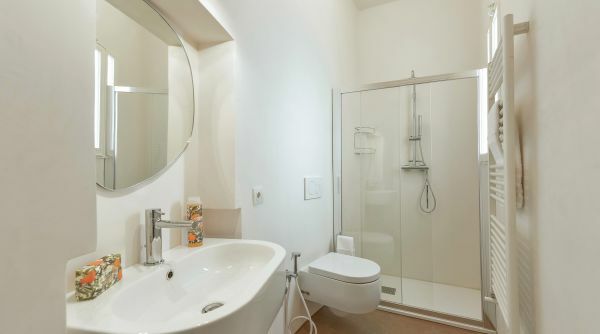 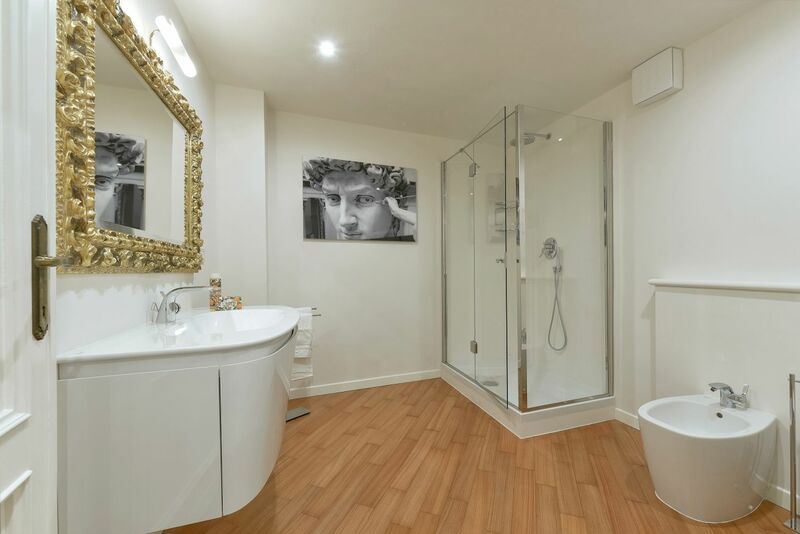 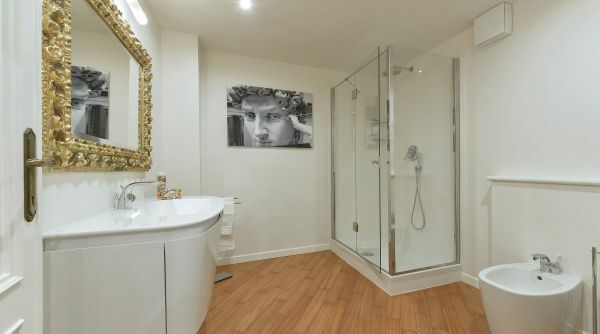 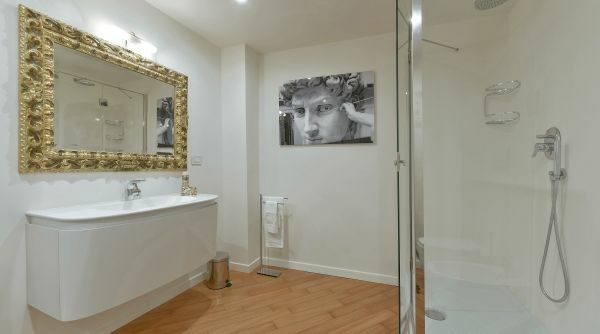 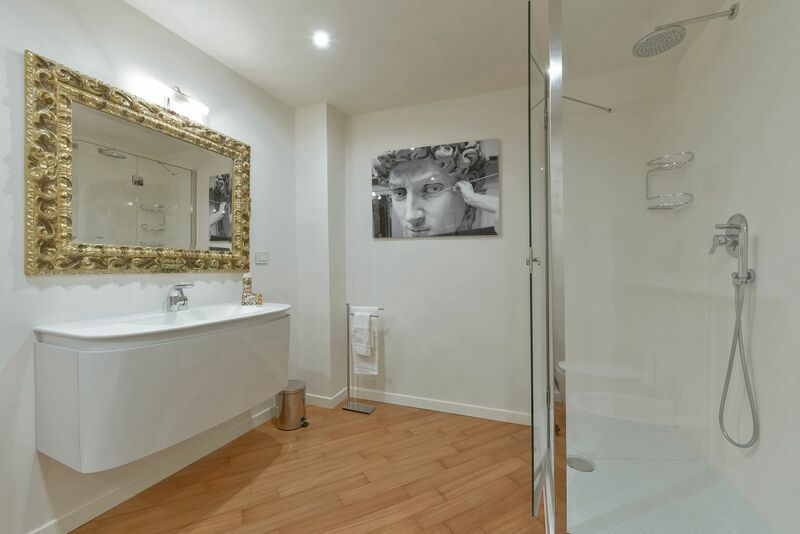 Just outside the bedroom you'll find a full and recently renewed bathroom with walk in shower. 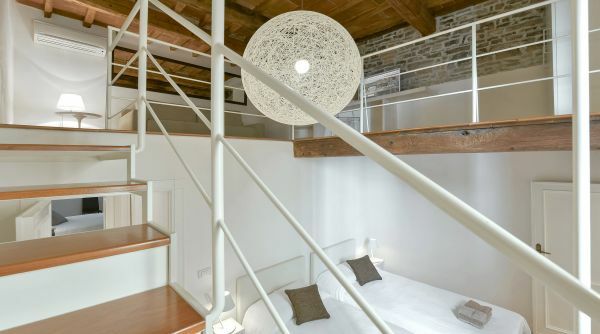 The second bedroom is also very spacious and refined, equipped with a couple of single beds (which can be unified and become a queen size bed), closet, and a lovely living area with sofa bed a smart flat screen TV on the mezzanine level. 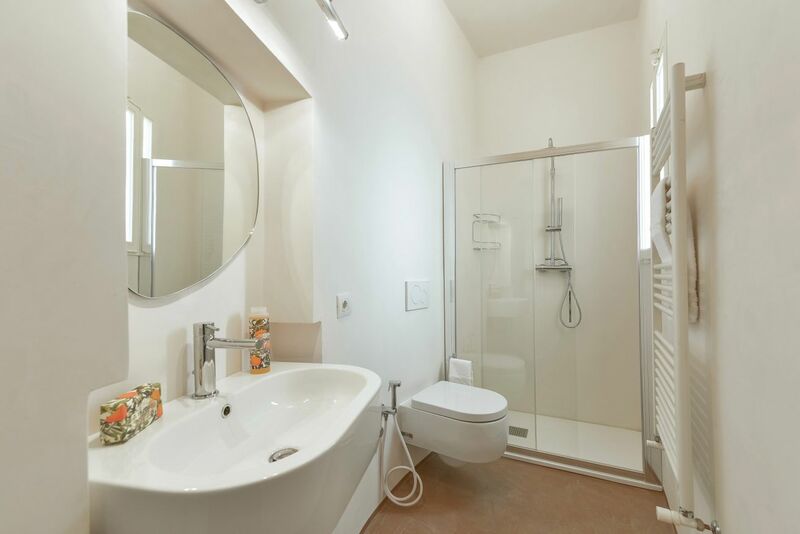 This room also benefits from the presence of its own private bathroom, modern, chic and with a glass walk in shower. 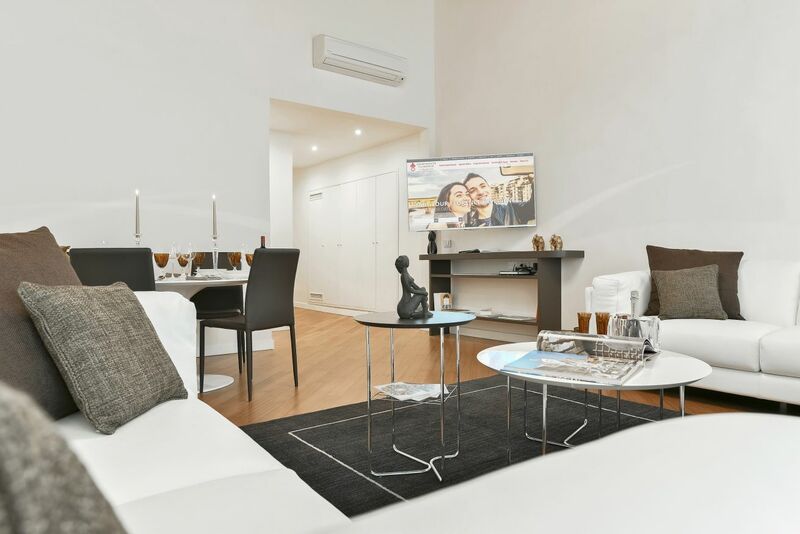 AC system in every room, with individual remote control. 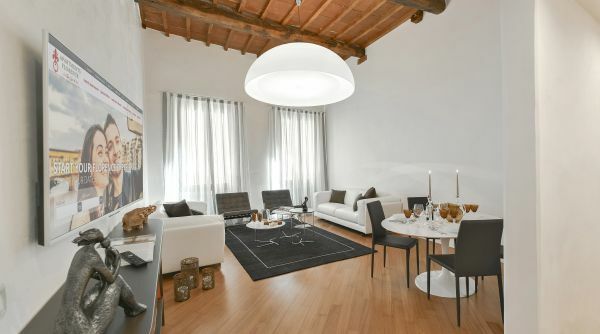 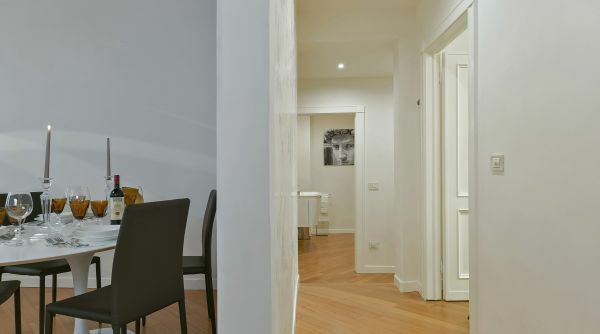 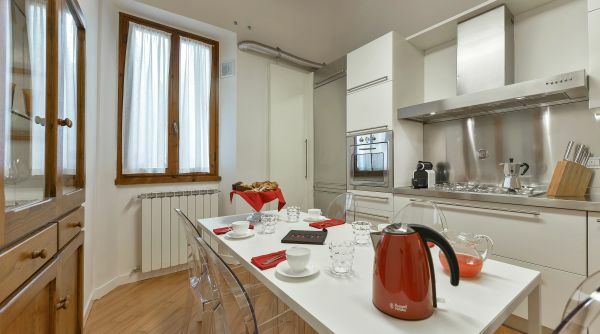 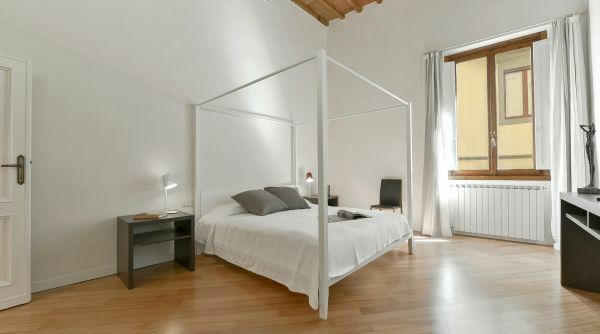 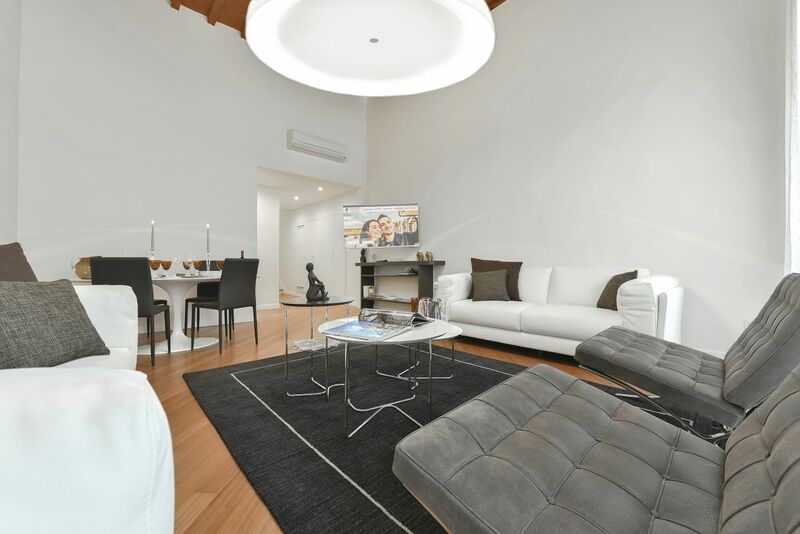 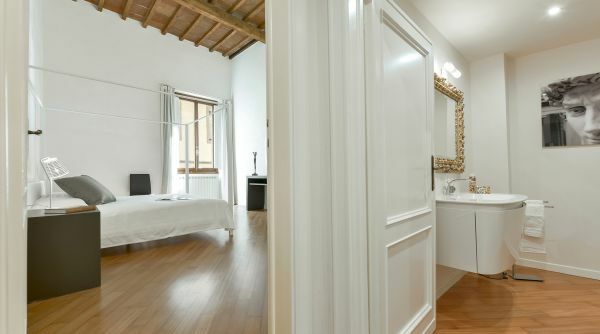 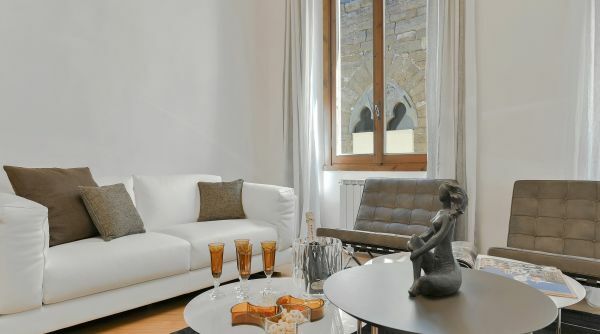 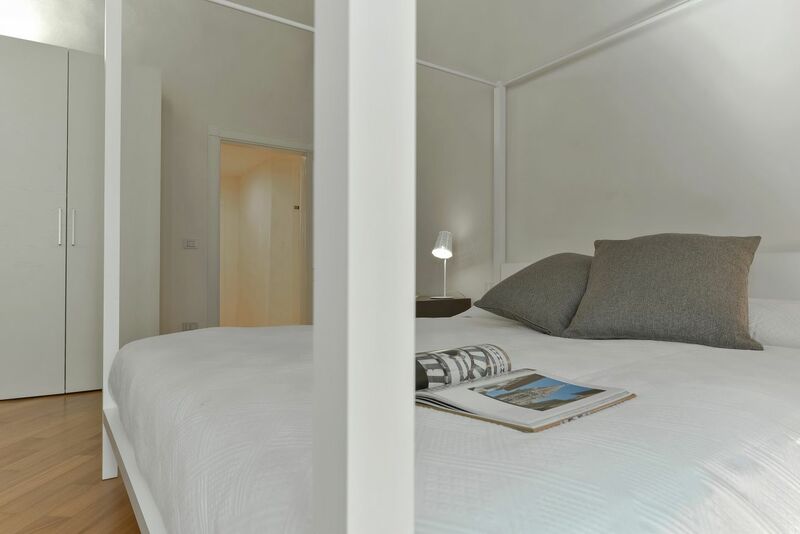 This apartment's strategic location and unique interior features make it an extraordinary location, easily accessible from the Santa Maria Novella train station and ideal starting point to explore all Florence on foot. 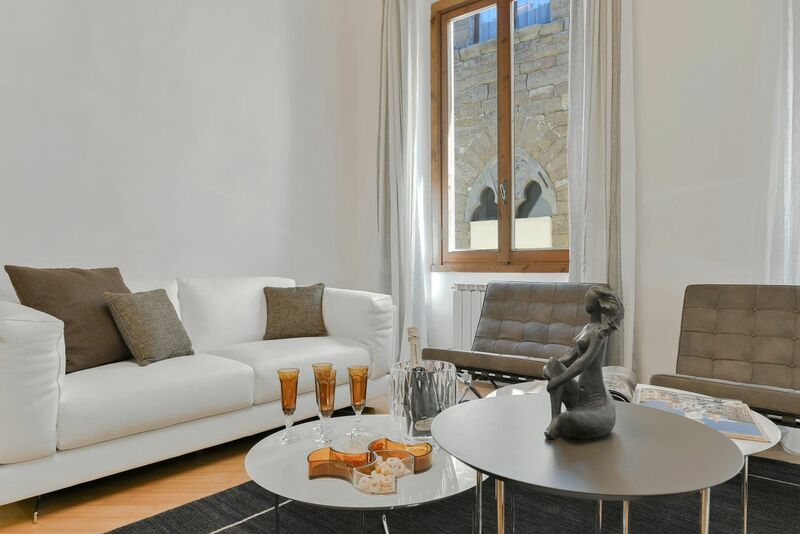 Via Tornabuoni, Florence's most fashionable and luxurious shopping street is located only a few steps away from the apartment. 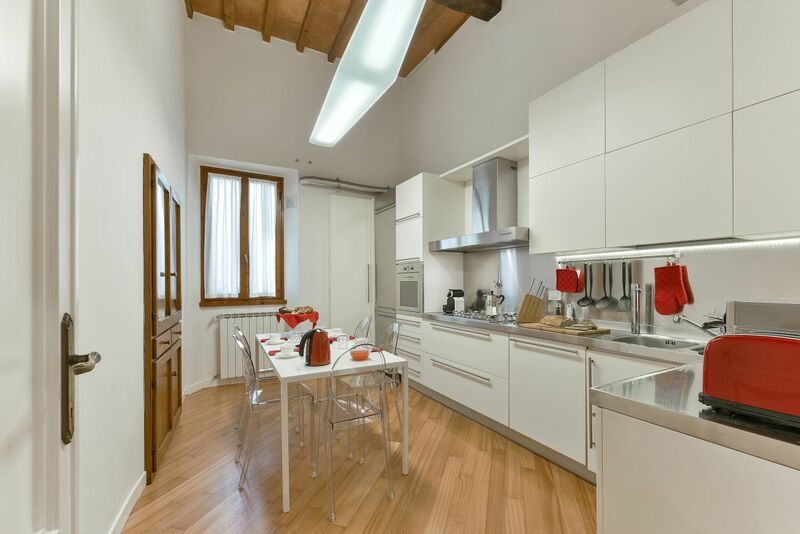 You are also just a short walk away from the Duomo, the Arno River, Ponte Vecchio and the Uffizi. 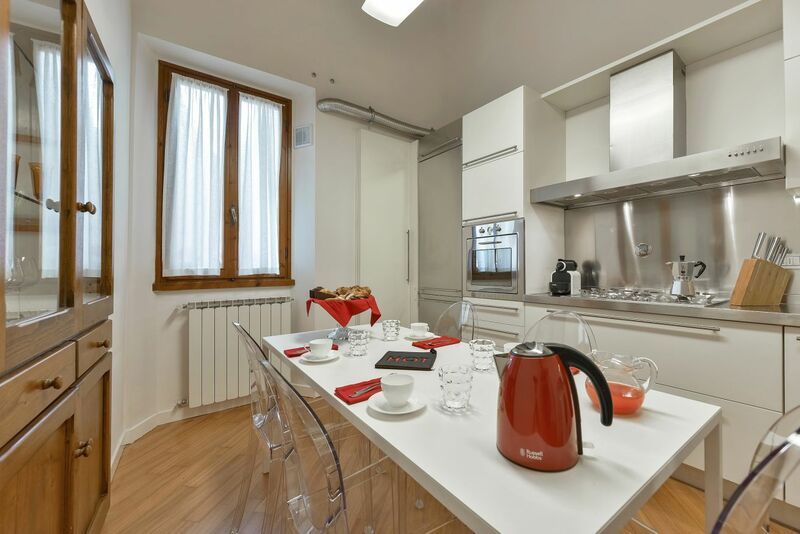 This area of town is also known for its vast array of Florentine restaurants, cafès, bakeries and shops: you will be spoiled with all the choices!